As an informed consumer, you probably know that Water Treatment is ''case specific''. There is no such thing as ''one method, or one model - is good for all''. 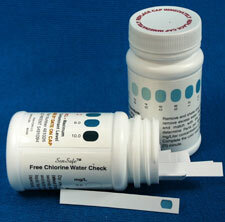 Test your water before buying any water treatment product! First you should know what's in your water. Then (and only then!) you can make a better decision on which equipment to buy. PurTest® Home Water Analysis Kit is ideal for new homeowners, and is economical for anyone who has not tested their home water recently. PurTest® Toll-Free 800 hotline provides free general phone assistance if questions arise before, during or after your tests. 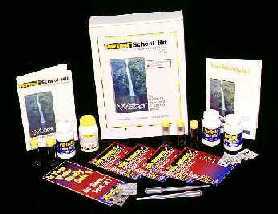 All of the above are available in other PurTest® kits. This kit allows you to screen your water for many elements easily right at home; there's nothing to mail in and no additional lab fees. 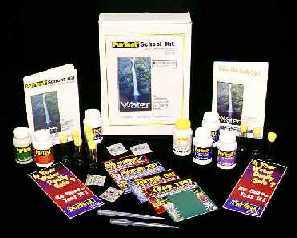 The PurTest(r) Project School Kit is ideally sized for a science fair project or small group experiment. Water knowledge booklets and test strips engage students in identifying 8 water contaminants / conditions, and learning appropriate corrective action to improve water quality. The PurTest(r) Project SCHOOL KIT contains enough material for 5 students. The Project Kit includes two copies of the 10 page Water Knowledge Booklets. The PurTest(r) Standard School Kit will enable you to guide students through 12 experiments with a well planned Teachers Manual. Learn how water acquires and naturally removes some contaminants. The PurTest(r) Standard SCHOOL KIT contains enough material for 30 students. The Standard Kit experiments include the Hydrologic Cycle, Building a Well, Acid Rain and the Dilution Solution along with a 14 page Water Facts book, water usage, monitoring and general water awareness knowledge. You owe it to yourself and to your family to test your drinking water regularly! yellow (positive) indicates unsafe bacteria are present. 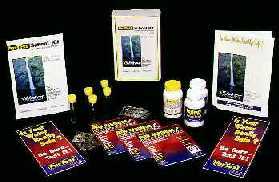 Now every Bacteria test kit comes with FREE Nitrate and FREE Nitrite tests. 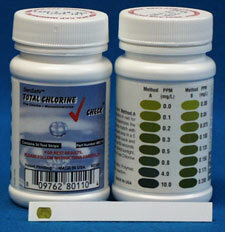 A color match or shade lighter (negative) indicates nitrate and nitrite levels are within EPA standards. A darker shade (positive) indicates a dangerous pollution level. The PurTest do-it-yourself EPA based method, allows you to screen your water for dangerous levels of lead. In a few minutes, this one-of-kind test allows you to check water for Lead in your home. Lead Testing is critical, since lead poisoning can present serious health risks, especially in children. 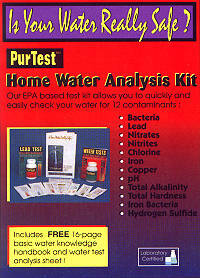 This Lead test, allows you to easily monitor your water for hazardous lead contamination. Since lead poisoning can come from pipes, solder, brass fittings and fixtures, or be in the water itself, it's best to check each faucet for lead. Treating for lead contamination is critical since lead poisoning can present serious health risks such as gastrointestinal disorders, paralysis, brain and spinal cord damage, especially in children. If pregnant, lead contamination can result in miscarriage. 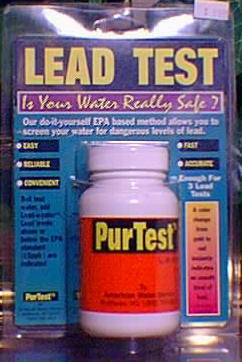 PurTest Lead test, is used and tested by health departments, utilities and inspectors. Arsenic sometimes naturally occurs in water and can be found in public and private water supplies. Mining operations, semiconductor manufacturing, and use of wood preservatives are some of the ways water can be contaminated with this poison. If you have a private well you should test for arsenic at least annually because arsenic is often found at levels over 100 times the U.S. EPA safe standard. PurTest(r) ARSENIC provides an easy method of screening water for arsenic, in just minutes, conveniently right at home or in the field. There is nothing to mail and you get instant results. By identifying arsenic in your water, you can take steps to avoid the risks linking this substance to lung and skin cancer or death. 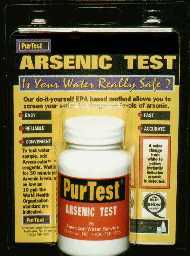 PurTest(r) ARSENIC allows you to easily check and be sure your water meets the safe standard for arsenic as established by the World Health Organization: 10 parts per billion (ppb). Each package contains one arsenic test. The latest product in a line of continuous product innovations, the SenSafe Free Chlorine Water Check offers the user an extremely comprehensive testing system. Currently under U.S. EPA evaluation, the test offers a range of 0.05 to 10 PPM (mg/L) with no monochloramine interference. With accurate and reproducible results in less then a 1 minute, the SenSafe Free Chlorine Water Check is sure to revolutionize Free Chlorine testing as you know it.